History: The original almshouses were built in 1630 by Edward Wilkes in memory of his father John Wilkes (see also the will of Edward Wilkes). 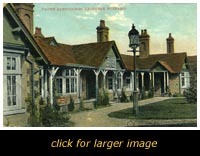 The buildings were rebuilt in 1857 and then subsequently extended in 1873. 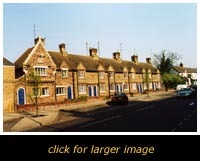 The almshouses provide housing for ten poor widows. Edward's son Matthew bequeathed funds in his will for an annual commemoration to take place on Rogation Monday at the almshouses, and this ceremony still occurs every year. 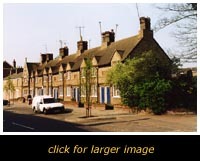 History: These almshouses were built in 1903 following a request in the will of Councillor William Sharp Page. They are located adjacent to the former site of St. Andrews church, and actually on the site of the sandstone quarry used for the construction of the church. Councillor Page also bequeathed a field to the town to be used as a recreation ground and which is now known as Page's Park.